On the approach to Cabo de la Vela there actually is a pyramid-shaped landform that does resemble a sail. After sailing all night, we all needed a rest before continuing on to our next stop. As an aside, only in the season when the winds and seas are a little bit lighter- mostly in October and November- do sailboats en route to Cartagena stop at these anchorages. When the trade winds are more established and stronger, with accompanying very high seas, boats make the long passage direct. We are fortunate enough to be able to see these parts of Venezuela and Colombia that are infrequently visited by cruisers. Swimming here was out of the question. The area is aptly named Cape Sail as the winds blow fiercely all the time. The water was whitecaps as far as one could see. In the 25- 30 knot gusting winds ANGEL actually did "sail" almost 3 miles at anchor, according to the GPS! We sat on board throughput the afternoon and watched tour vehicles deposit hikers at the lighthouse. The scene was very peaceful, with sheep grazing the hillsides. Even the wind farm nearby seemed to be taking an afternoon nap! 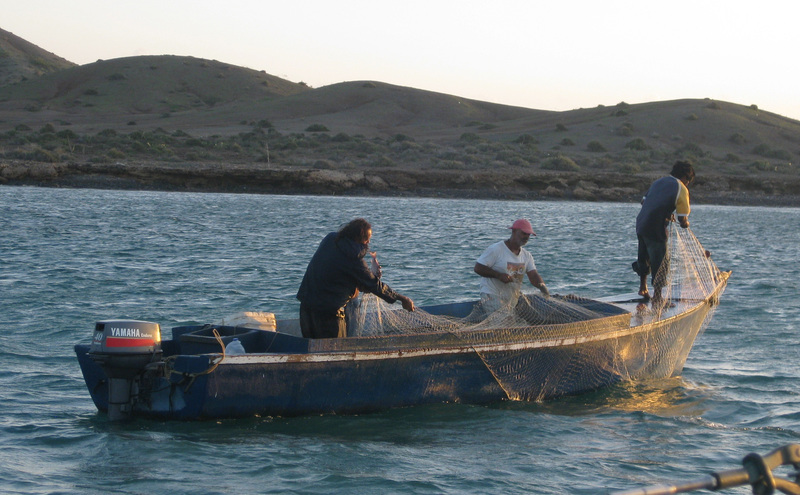 In the morning we were greeted by some fisherman who were hauling in their nets almost from under ANGEL!